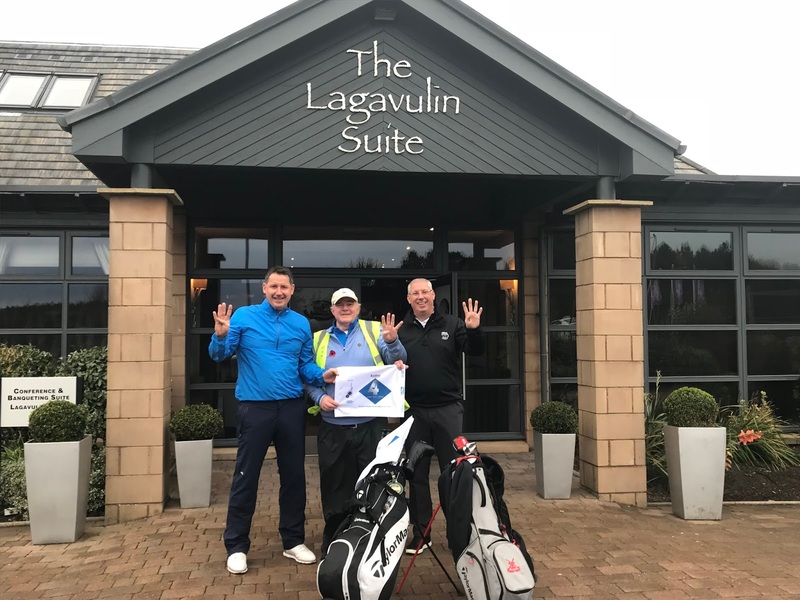 Cancer survivor and fundraiser Nick Edmund dropped into The Gailes Hotel this week as part of his ongoing mission of walking and playing golf the length and breadth of the country. Edmund is the founder of Global-Golf4-Cancer (GG4C) charity and is a two-time head and neck cancer survivor. He launched the 4-Flag Campaign in March 2017 with a 2,000km walk along the Wild Atlantic Way in Ireland while carrying a set of golf clubs. “The aim of that golf-walk was to visit 40 golf clubs and personally deliver a GG4C flag to each golf club after playing their fourth hole,” said Nick, who is now in Scotland on a second major walk. Nick previously spent 15 years running Nick Faldo’s design business. “What doesn’t break you, makes you…it’s amazing what the human spirit can achieve,” he famously said after completing the Wild Atlantic Way. This week Nick has been in Ayrshire and after visiting places like Turnberry and Prestwick, he made the short walk across the road from The Gailes Hotel to play the fourth hole at Dundonald Links, venue of the 2017 Scottish Open. Nick was joined for this leg of the journey by Prestwick Head Professional David Fleming and Turnberry Director of Golf Ricky Hall. Nick is also planning to walk the Camino in Spain and in tribute to his golfing hero Seve Ballesteros, who died of brain cancer in 2011. Nick plans to start that walk in Pedreña where Seve started out in golf. “The walks are important to raise the profile of the campaign and to draw attention to what we are trying to do and to help the golf industry support cancer charities and initiatives around the world,” added Nick. Nick is a truly inspirational figure and from everyone at SimpsInns we wish you well. More on Nick Edmund and Global Golf4 Cancer.